More than a hundred killed in weekend violence around Yemen's key port city of Hodeida . Fighting has escalated around Yemen's key port city of Hodeida, with at least 150 combatants killed over the weekend from both the rebel and government-backed sides, officials said Sunday. The rebels, known as Houthis, said they repelled the latest offensive on Hodeida, killing or wounding 215 troops, but did not provide a breakdown. They said they destroyed 20 armored vehicles over the past 24 hours. Fierce fighting also erupted in the provinces of Bayda, to the south, and Saada, a Houthi stronghold in the north, they added. The offensive came despite recent calls by the Trump administration for a cease-fire by late November. Yemen has been at war since March 2015 when the Houthis occupied northern regions and forced the government into exile. Since then, a Saudi-led, U.S.-backed coalition supporting the largely exiled government has blockaded the rebel-held north and waged a devastating air campaign, causing thousands of deaths. The U.S. has sold billions of dollars' worth of arms to Saudi Arabia and provides logistical and other support to the coalition. The coalition accuses the Houthis of acting as Iran's proxy. The war has led to one of the world's worst humanitarian crises. Three-quarters of Yemen's people require life-saving assistance, according to the U.N. Population Fund. An estimated 10,000 people have been killed and more than 8 million are at risk of starvation from a looming famine. The regional director of the U.N. children's agency, Geert Cappelaere, said the warring sides in Yemen make it difficult to deliver and distribute humanitarian aid to the country. 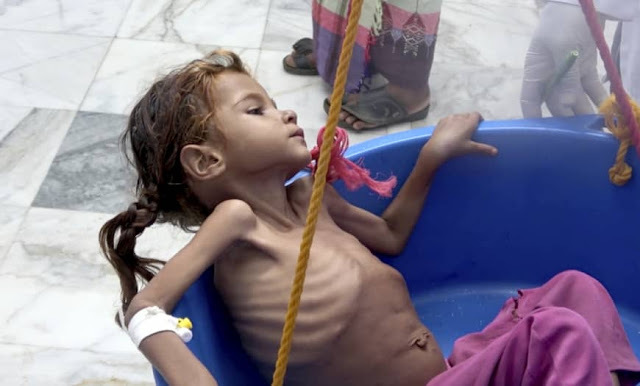 He said the situation is a "living hell" for all Yemeni children, singling out the death last week of 7-year-old Amal Hussein who had suffered from severe malnutrition. "Unfortunately, Amal is not the only Yemeni child suffering that fate," he told a news conference in Amman, Jordan. "Thirty thousand children in Yemen die every single year of malnutrition as one of the most important underlying causes. There is not one Amal there are many thousands of Amals." The Associated Press had photographed Amal whose name means "hope" in Arabic in August. A photograph of the emaciated child with a protruding rib cage and stick-like arms also appeared recently on the front page of The New York Times. Medics say her death was the result of insufficient medical care as supplies dwindle and many people like Amal live far from treatment centers. Mariam Ali, Amal's mother, told the AP on Sunday that she had been walking on foot under the rain for over an hour to reach a health center when her daughter died in the middle of the road lasts week. "I collapsed and only woke up to find myself home surrounded by neighbors who wrapped me in a blanket while my husband took Amal away," Mariam said. She has six children who have suffered bouts of vomiting and diarrhea but recovered, whereas while Amal was sick for four years before she passed away.